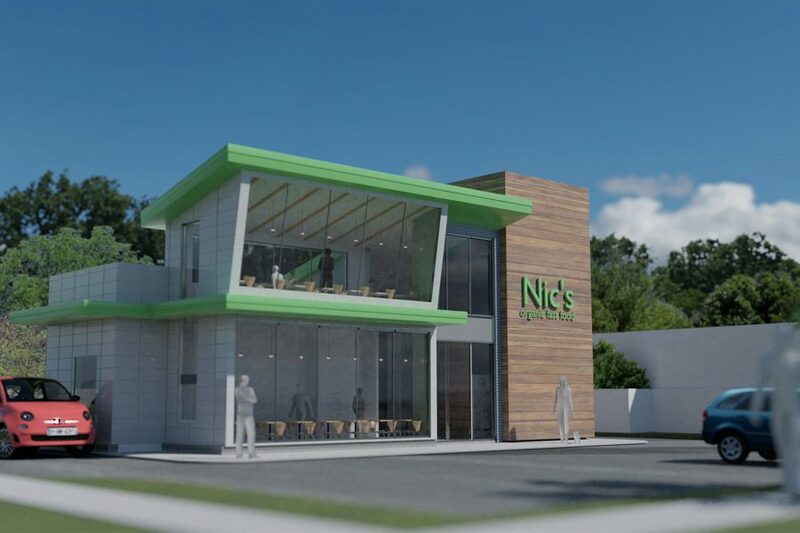 A proposed rendering of Nic’s Organic Fast Food, 2628 Gross Point Rd. Owner Benjamin Brittsan hopes to open the second location of his chain next spring. When Benjamin Brittsan and his wife Nicolette noticed a lack of fast-food restaurants that guaranteed organic fare to their customers, they decided to step in and fill the gap themselves. Their solution was Nic’s Organic Fast Food, a drive-through restaurant where customers can buy classic staples like hamburgers and fries, and where all ingredients are certified organic by the U.S. Department of Agriculture. The couple opened the first location in March in Rolling Meadows, Illinois, with plans to expand in Evanston. He and his wife plan to open their second location at 2628 Gross Point Road in Evanston. However, some aldermen expressed concern over the proposed location and the owner’s parking situation at Monday’s Planning and Development Committee meeting. The restaurant would be situated in an area that is largely residential, Brittsan told The Daily on Tuesday. He added that the size of the building is proportional to the parking needs surrounding it, but that residents have expressed concern about possible loss of street parking. Ald. Tom Suffredin (6th), whose ward would contain the restaurant, expressed concern about Brittsan’s lack of a formal parking agreement. At the meeting, Brittsan said he acquired permission from the owner of Sarkis Cafe, which is adjacent to the proposed site, to use six parking spaces from their lot. Still, aldermen remained concerned about the parking situation. Suffredin pointed out that Sarkis does not actually own the lot, and thus could not enter into an enforceable parking agreement with Brittsan. Other aldermen took issue with potential traffic for the site. Ald. Judy Fiske (1st) said at the meeting she thinks the drive-through nature of the restaurant — in addition to delivery trucks — wouldn’t be “appropriate” for the neighborhood. The proposal was ultimately held in committee, giving Brittsan more time to work out a parking agreement. Suffredin told The Daily that he and Brittsan met Tuesday, but declined to comment further. Brittsan said they discussed how to move forward and come to an agreement, but also declined to elaborate. Brittsan told The Daily he might consider downsizing the building to accommodate parking concerns, but would prefer to instead establish enough spots. The proposal will be revisited at the next committee meeting in two weeks. Brittsan told The Daily he hopes they can start construction on the restaurant before the frost, or in early spring, with an opening of late spring to early summer 2018.